and the only limit to your results is your imagination! As a kid, i was into finger painting - and then hundreds of art projects. At one point, I was actually painting houses - inside and out. I painted props and walls and fixtures for retail displays. I taught an art class for gifted kids, and taught them how to cartoon and paint murals. and painting furniture for my small store, farmer's markets, and clients. In the end, I ended up creating new furniture out of old stuff, and adding paint finishes to it. Seems I've had a paintbrush in my hand most of the time! 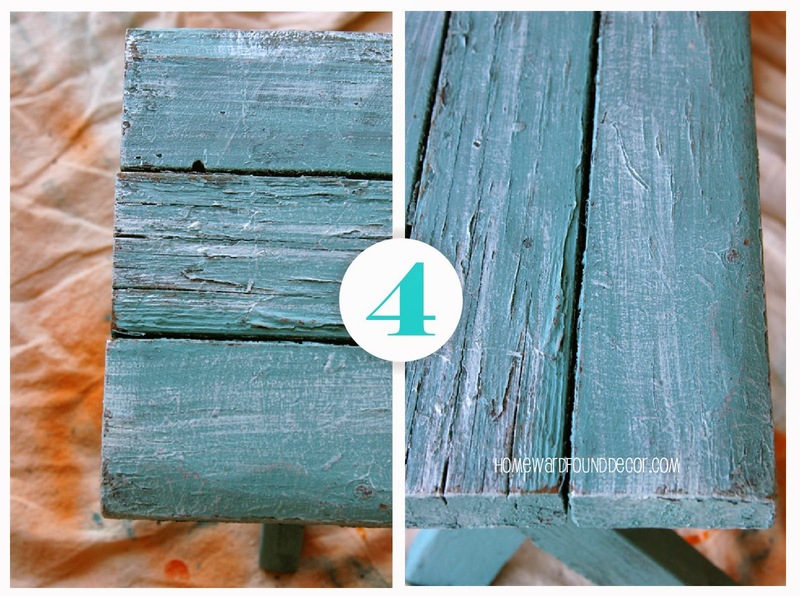 Recently, I laid my eyes on an old, worn out picnic bench that Mom has had for YEARS. She was in my Garden Bar post as a supporting player. Nothin' much to look at, really. and that bench became a STAR! She's got a terrific weathered & worn 'beach vibe' now - ready for Summer! 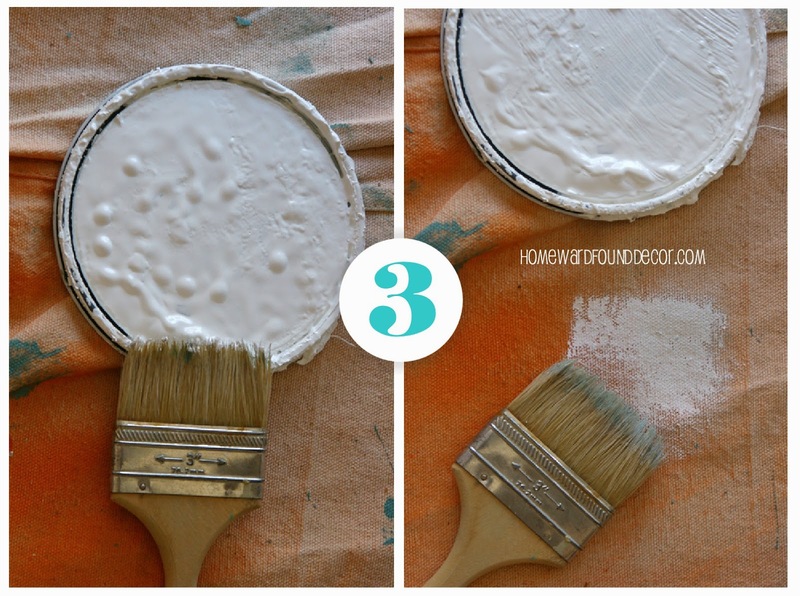 Paint a clean, dry item with paint color 1. Flat or satin finish is best. 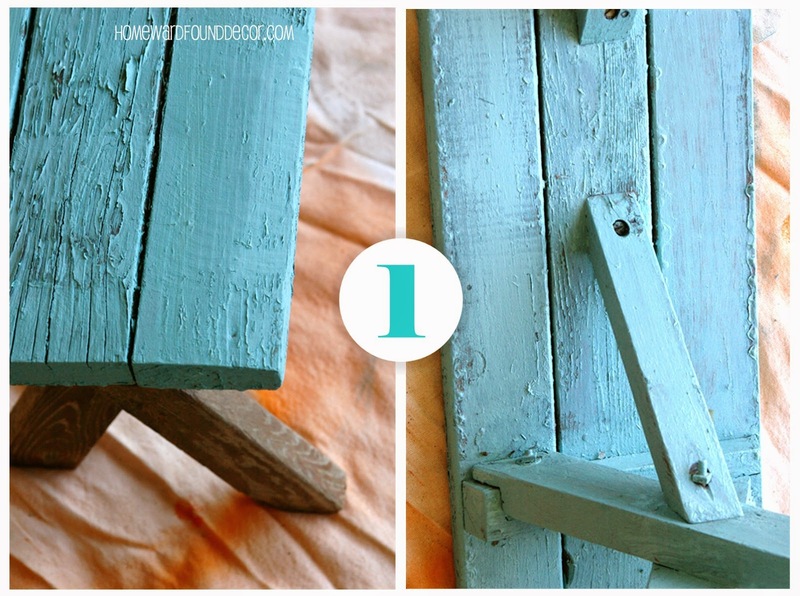 Here, the item is an old wood bench and paint color 1 is aqua. wearing away paint color 1 at the edges and along joints. Sand in long strokes, not in circles or swirls, so it looks like authentic wear & tear. Dip the tips of a paint brush in paint color 2. Here, that color is white. Then stroke the brush against a dropcloth, rag, or cardboard box to remove most of the paint. 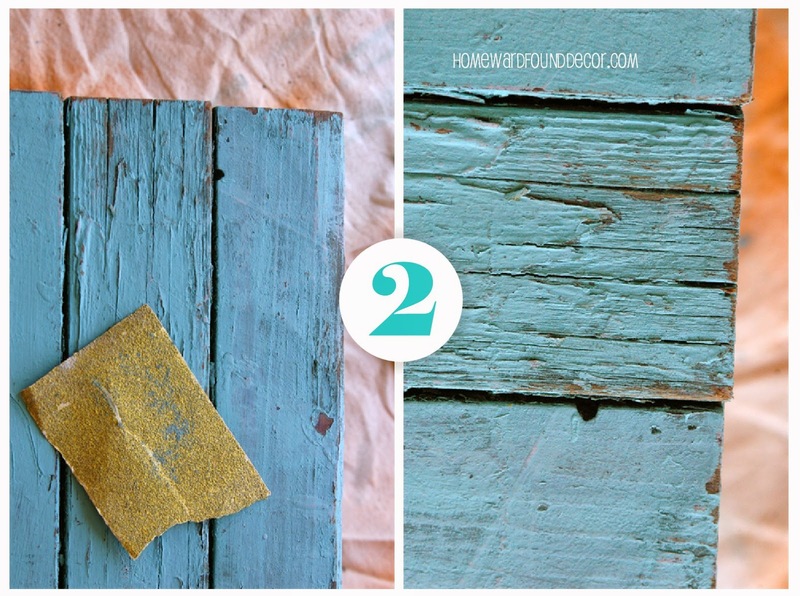 Drag the almost-dry paint brush bristles across the item, depositing a small amount of paint color 2. Do not press hard, just drag the brush over the item's surface to highlight the texture. Use long strokes across the length of the item - with the grain. wearing through the white drybrush coat into the base coat. 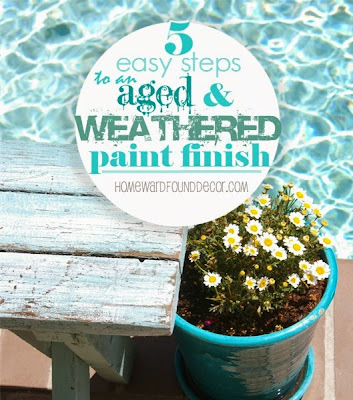 instead of looking like an overworked 'faux' finish. 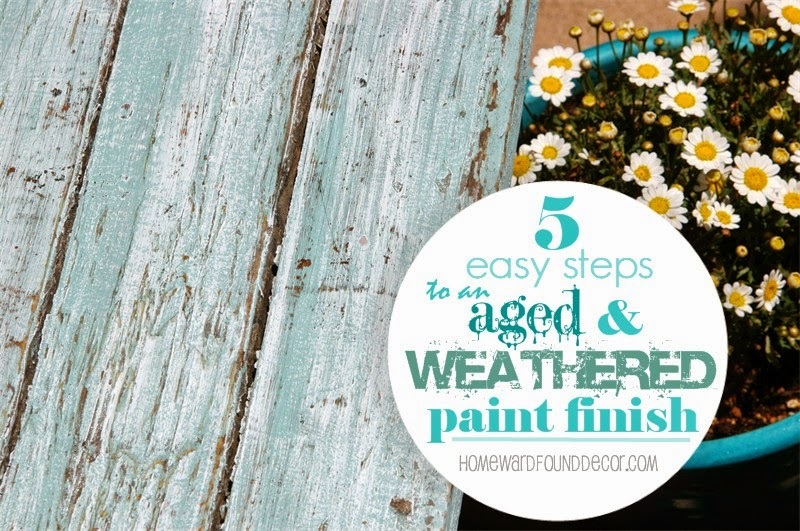 or you can add a sixth step: add a coat of clear matte-finish varnish to protect it. 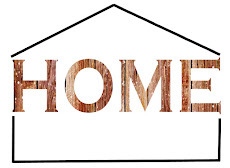 birdhouses, fences & gates, even decks! in my Breakfast at Tiffany's post! 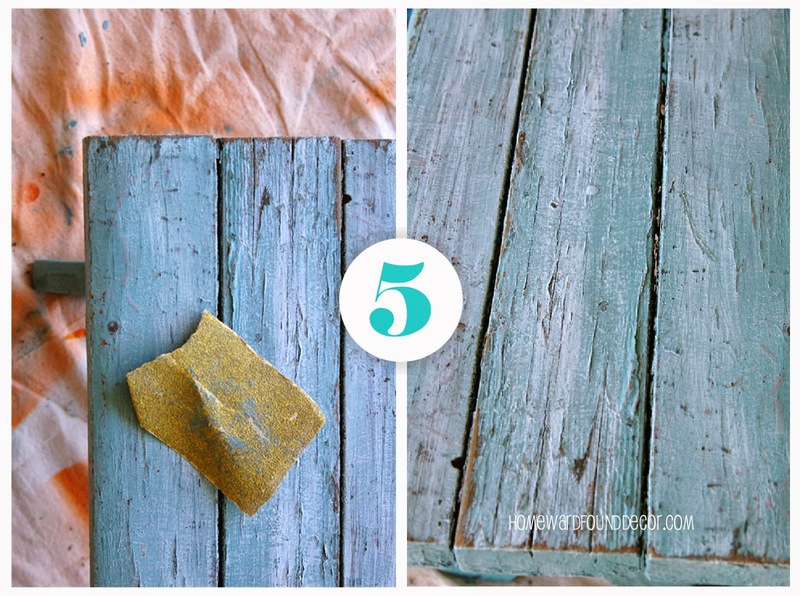 Thank You, Brooke, for featuring my post on your blog! That looks fantastic Deb! Great job, you know how much I love aqua!! Doggone it, I've been doing it that way but people here don't like distressed at all. They ask me why they should buy something that looks old and battered. Obviously not aware of different style and looks good now. (here is west of Grand Junction, Co, we live about 18 miles west of G.J. out in country) I need to find a better and different market for what I do, I'd like to be able to sell some items. Your tutorial is excellent and quite understandable, doable. How do I educate people here? Post Archives + Topics at bottom of page. hwF closed October 1 2018. please visit tabs in sidebar for seasonal content archives! * all content is original - ideas, words, photos. * sponsored posts - nope. * unsolicited guest posts - nope. * ads & paid links - nope. * anonymous comments - nope. * comments with ad links - nope. 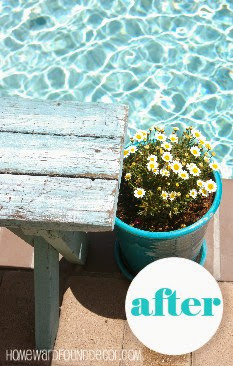 all ideas, projects, and tutorials on this blog are shared for the purpose of inspiration. undertake projects at your own risk. connect online: Facebook . Pinterest . Instagram . YOUtube . Red, White and Blue - Water?! Jewelry Makeovers: Bling It On! Cinco de 'Orange Crush' Mayo! CLICK HERE FOR COMPLETE CONTENT USE GUIDELINES and copyright infringement information. All photos on this blog have been taken by me and are my own property unless otherwise credited. All are ©debkennedy images | Debi Ward Kennedy. 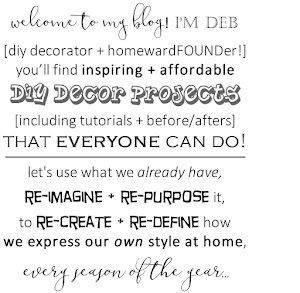 All blog content is ©Debi Ward Kennedy and homewardFOUNDdecor. You may share, pin, and link to my images - please do NOT crop or alter them. 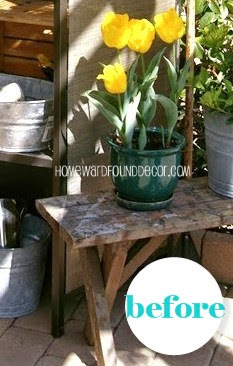 Please link back to http://homewardfounddecor.com with each use of my photos. Photos from my tutorials may not be used in tutorials on any other web source, book, magazine, etc. NOR may they be replicated by copying the contents or styling by using your own materials. Photos from my Sweet Sweater Pumpkin tutorial may not be pinned, shared, linked to, downloaded, or otherwise used in any way. Photos of my Sweet Sweater Pumpkins or any other product for sale may not be used to advertise, market, or promote any product not made by me. You may not copy any or all of my text for use in other places - but you may link to my post. Scraping or re-broadcast of post content is expressly prohibited. Thank You! 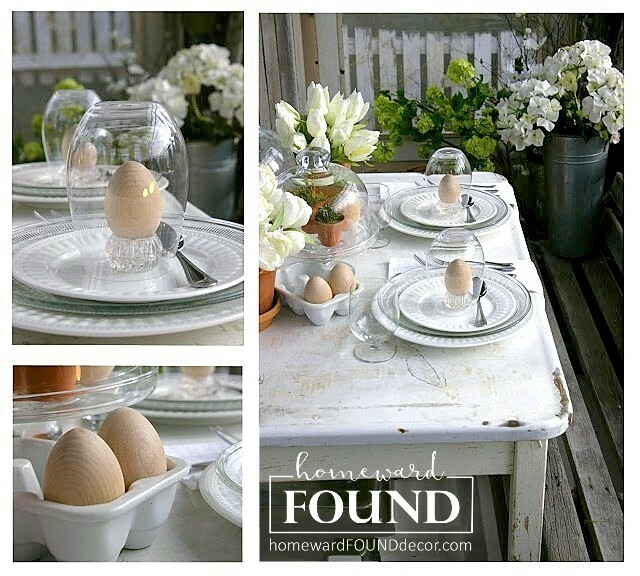 All content, images, trade dress, etc copyright 2012- 2019 Debi Ward Kennedy | homewardFOUNDdecor. Powered by Blogger.